Recolours Recolouring Recherche rug - stuck! Recolouring Recherche rug - stuck! Not sure what I've done wrong with this rug but there's a large gap in it. I made one layer starting from the centre of the full rug and then copied that layer, flipped it and joined it back in. 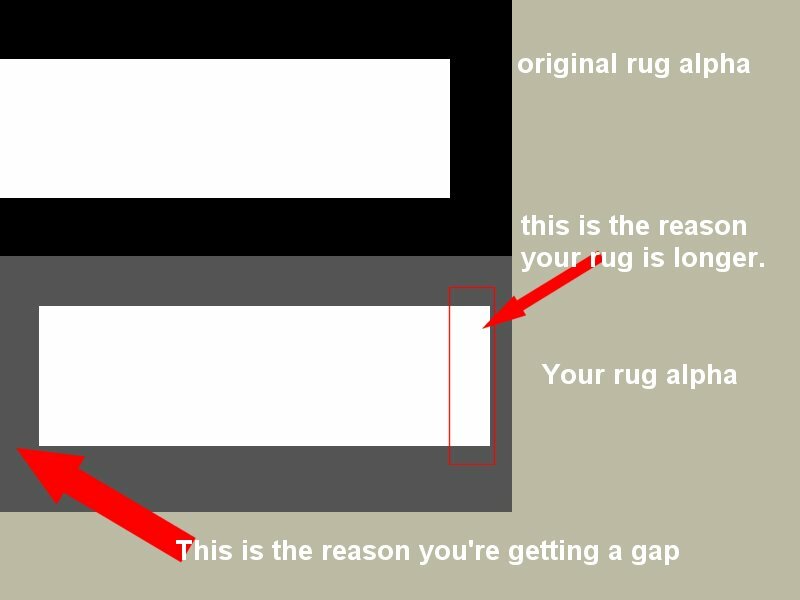 For there to be a gap like that, the alpha layer is the one with the problem. I'm assuming you save it as a PNG file? Unfortunately I don't really understand how PSD works, but I do know how SimPE works. So this is how you can check what's happening with your alpha channel. 1. Open up SimPE, and Open up your recolour package. 4. Close SimPE, and select the png that has '_txtr_alpha_' in the name. That will show you what your alpha channel is doing. 5. My guess is that there will be a gap in the alpha channel image where your hole is. What I think has happened is that the alpha channel is attached to each of your layers, and when you've flipped and joined it, you've somehow amended the alpha channel as well. Lee would know better what it is. If this is the problem, there is a simple way to fix this, believe it or not, that I can tell you how, that is paint program independent. 1. 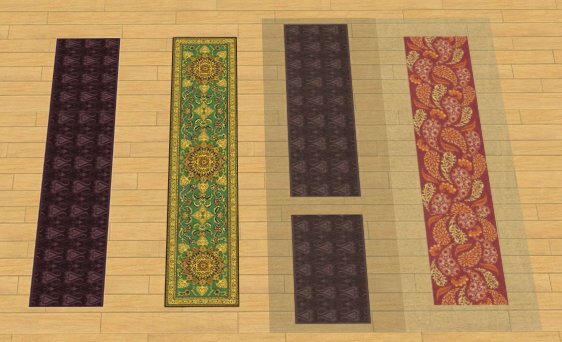 Make another recolour package of the rug. And export the image from that - it will include the original alpha channel (which is what we want). I'm going to call that "O.package"
2. Open up your recolour image that has the funny alpha channel in your paint program and save it as a BMP. The reason why you are doing this, is because you are stripping both the layers and more importantly the alpha channel from the image. Don't worry, this is not the end of the process, but it will get rid of the hole in your rug. Close your image up. 3. Open up the image from the O.package, and then open up the bitmap into your paint program. 4. Copy your bitmap image onto the O.package image. At this point the only layer that has an alpha is the O.package image. 5. Save your O.package image with your rug on it. 6. Open up your recolour of the rug, and do a build DXT using the O.package image from Step 5. You should now have a repaired alpha channel. What does the alpha channel look like? In game it looks the same but with a white background. Can you parcel up the package/psd for me so I can have a closer look at what's happening? That looks like something strange is going on. In the alpha channel, the white bits is where it shows, and the black bits is where it doesn't. Looking at the alpha channel that you've put up - it's should be completely showing. Thank you, Kiri. Think I've managed to put everything you asked for in the archive file. OK. It is a problem with the alpha. 1. Your black is light grey so it leaves a halo. I've downloaded a copy of PSD to see if I can work it out... will edit this post in a bit with instructions on what to do. OK! I see what's happened! You copied the original onto your pattern, and when you did that PSD very helpfully centred the pattern for you instead of leaving it where it was in an absolute position. 1. (And the simplest) - copy your pattern layers onto the original and re-position it based on the original. I've just tried this in PSD and the things to remember as you're copying it over - Ctrl+C for copy, you need to do a Ctrl+A to select the whole image, and to do it layer by layer you need to make sure you have the layer you're copying selected,before you copy it. You will not be able to copy over your effects layer in this way. or for the moment, you need to not use the effects layer. * leefish sees that kiri has it all under control.